Not many schools in Michigan provide Forestry as a major. Just 2 to be exact. College students are going to pay prices around $79,230 and $246,625 in Michigan to get their Forestry degree. Starting salaries of $38,635 and mid-career salaries of $67,437 are typical for a graduate with a Forestry degree. 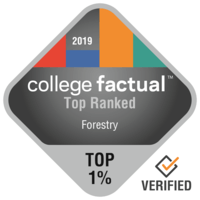 See the best Forestry colleges within Michigan. Keep scrolling to see the best universities and colleges in Michigan for Forestry majors. Some of the factors included in the ranking methodology are graduate salaries, loan default rates, accreditation, and more. Michigan Technological University is a wonderful choice for students pursuing a Forestry degree. In addition to its bachelor's programs, Michigan Technological University offers graduate degrees in Forestry. Students who enjoy a more slow-paced life will value the school's location in the compact town of Houghton, Michigan. With its low price and its excellent education, Michigan Technological University is a great value, attaining a rank of #2 in Michigan. Freshmen are not required to live on-campus at Michigan Technological University. See all of Michigan Technological University's rankings to learn more about the college. Every student pursuing a degree in Forestry has to take a look at Michigan State University. In addition to its bachelor's programs, Michigan State University offers graduate degrees in Forestry. Prefer a sizable student body? This school has over 20,000 students on campus. This school has great value for students in Michigan. Freshman students are not required to live on-campus at Michigan State University. For more info, look at college scorecard.